The main Military forces in the Former East Germany during the time of the Cold War were the East German ‘National VolksArmee’ (NVA) which included the Army, Navy and Air as well as the Border Guards of the DDR and numbered at around 350,000 troops. There was also the Feliks Dzerhinsky Guards Regiment consisting of around 12,000 troops, who were the military arm of the feared Stasi Secret Police. The other force present in East Germany at this time was the Soviet Army (The GSSD, Gruppe der sowjetischen Streitkräfte in Deutschland, otherwise known as GSFG or Group of Soviet Forces to Germany) who numbered around half a million troops – the largest Soviet Army force outside of Mother Russia. These troops needed massive swathes of land in East Germany (Deutsch Demokratische Republik – DDR) for training and manoeuvres. Within these training areas many command, communication and control bunkers were constructed to administer the forces during training. They alst were to act as fall back command posts in the event of war. The Soviet forces training area was concentrated around what is now the Brandenburg district. The entrance for bunker 1 goes down a surprising distance into the earth (approx. 30ft  40ft down some stairs). This bunker is double level with the middle area being a 2 level ‘plotting room’ complete with remains of a tote board. Its use is unknown although it does have a large amount of communications equipment with large amounts of telephone cables coming in one end and exiting out the other end of the bunker. Also of note it had air filtration but no accommodation or canteen facilities and only one toilet. 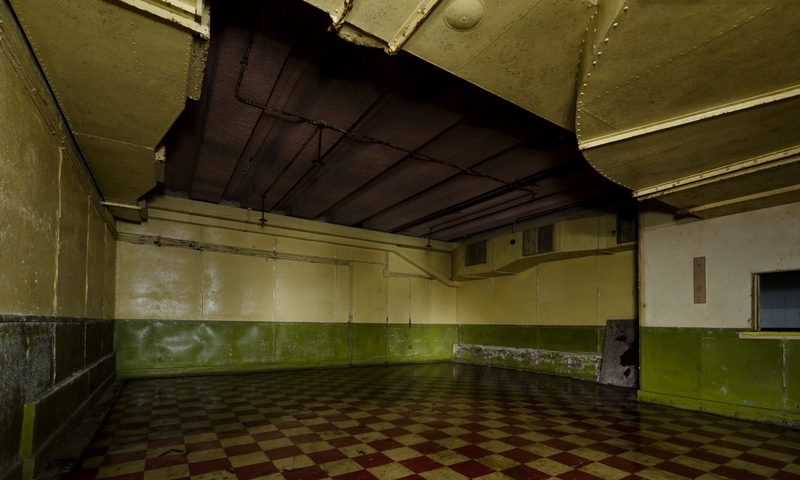 Although the Soviets comprehensively stripped their facilities when they left Germany so evidence of bunks or canteens could have been obliterated. Its also worth noting that the bulk of communications within the Soviet Forces in Germany were by telephone and telex so this bunker could be a command point or a communications station, and one room was certainly wallpapered and more grand than the others which would indicate someone with some seniority using it. Some extra information has been forthcoming about this bunker that we stumbled upon whilst searching for something else on the internet (2013). The bunkers were used for the Command and Control of the rear of the 1st Western Front and the 133rd Guards Anti-Aircraft Missile Regiment at Juterborg. The second bunker in this pair was very similar but much smaller and only single level, with a number of rooms off of a central corridor. Again this bunker had no accommodation or kitchen facilities that could be seen. Other than the smaller size this bunker was very similar to the to the first one in style and ‘feel’ with lots of comms provision. Both bunkers are almost rectangle in shape with rooms coming off of a central corridor, with the larger bunker having the 2 floor ‘plotting’ room in the middle. They are of a typical Soviet rough-and-ready style construction, with pieces of bottle top and tin can used to space out doors and support sinks etc. They look very unrefined when compared to the exacting German-built bunkers. These bunkers seem to made in a very uniform way, most of the Soviet bunkers are laid out and made from identical sections/doors etc just in varying sizes. This was probably to facilitate fast and cheap construction in the field. For photos of the second bunker click below.